I can hardly believe it but this is now the tenth anniversary of my annual review, and therefore I’ve been blogging for over ten years – how the internet has changed since 2007! Back then it was all about open APIs, personal websites and blogging. Facebook was a tidy and uncluttered alternative to MySpace, the first iPhone had just been released, Twitter was a year old, YouTube was only two, and I had a successful career as a Flash programmer, making Flash games and embarking on my speaking career. From a personal point of view, it’s been a remarkable ten years. I’m in an incredible position now, making a living from creating massive interactive light and laser art installations, a variety of electronics projects, a fun side-line in geek comedy, and regular conference speaking appearances. I could not be any happier. But this isn’t a review of the last ten years, it’s a review of this year – 2017! So let’s get started. 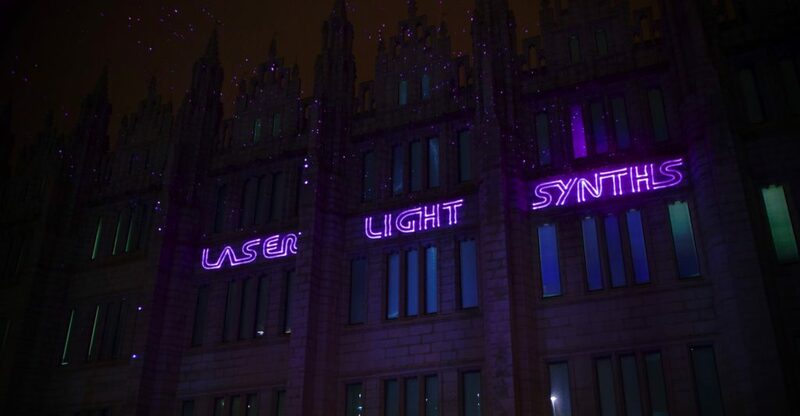 2017 has been my biggest year yet for light and laser installations, kicking off with Laser Light Synths at Spectra Aberdeen in February. It was the project’s second outing, which was developed considerably adding a host of extra synth sounds, including a very 80s-tastic slap bass. A brief installation at GEEK in Margate for Laser Arcade (including Laser Duck Hunt) and then immediately afterwards, PixelPyros was shipped off to Abu Dhabi with my crew for a two week run at Mother of the Nation Festival. In June, I was invited to project laser visuals on the side of a building for the Glasgow School of Art graduation show party. Over the summer I worked on a new prototype project, Lightning Catchers, which debuted at Enlighten Festival Bury. I built 2m long “lightning rods” full of super-bright LEDs and projected laser-generated lightning on the church tower. If you catch the lightning with your rod, it lights up and buzzes. I applied for an Arts Council grant to scale this up to 12 lightning rods but sadly this was rejected – my first failed application! As so often happens, this turned out to be a good thing. It meant that I didn’t have the budget to produce the full-scale interactive installation for my commission at Enchanted Parks in Gateshead and had to rethink the project. I ended up designing projections that recreated various electrical effects and projected them on to the iconic Saltwell Towers. I completely re-wrote my laser control code and hired two of the biggest lasers I’ve ever used and created a 6 minute looping show that was all algorithmically generated in real time. I very rarely produce things that are non-interactive so it was an interesting challenge. Not to mention way easier to set up and run! In February I packaged up a new project and sent it to Dublin for their Humans Need Not Apply exhibition. The Mindfulness Machine is a robot that likes to colour in. Based around an 80s plotter, it just quietly doodled away for the four month installation. R&D with Tim Casson on the interactive dance project Choreocracy continued in December and we have got full funding to finish it up and take it on tour! It’ll be visiting several venues in Spring 2018. I didn’t have as much time for speaking this year but still presented at a few good events. 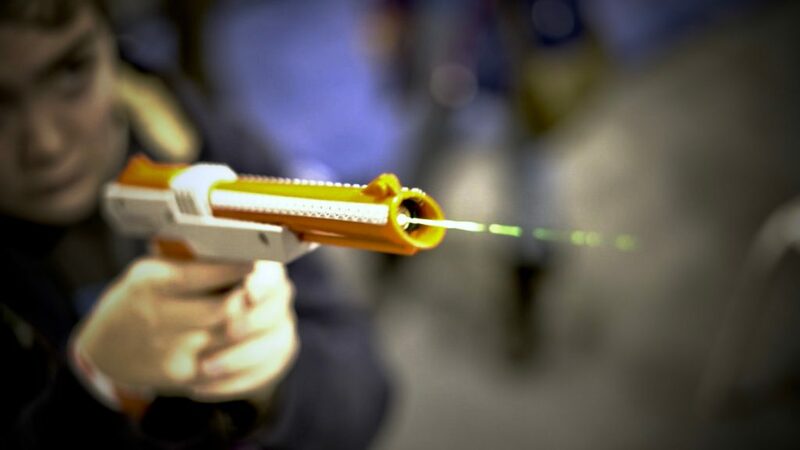 I brought my laser to Render Conference Oxford in March, and Generate London in September. And spoke at a handful of other events throughout Europe. Although I didn’t get the chance to perform Hacked On Classics this year, I did appear at a couple of Evenings of Unnecessary Detail and closed the year with Cosmic Shambles’ Nine Lessons and Carols event with Robin Ince. It seemed to go down really well and I expect it to lead to bigger and better things in 2018. Fun side projects this year included making a hardware single key keyboard and fully restoring an 80s keytar. Sadly the podcast was somewhat neglected; we only managed two episodes! Not sure what’s going to happen to that in future to be honest. But it’d be nice to getting it going again if I can. I’m not entirely sure how best to document and publicise my work these days. The last few years I’ve been relying on Twitter more than my blog, but I feel like that is less effective now (not to mention the nazi problem). I should probably redesign this site and update it – the projects page is woefully out of date. And I think I will re-instate my mailing list. It seems the way to go. But it’s been a great year for me, a fantastic mix of projects, all very exciting. And it seems like the art installations are taking off to a point where I rarely have time for conferences. As the year closes, I’m thankful for the success and the support I’ve had. Here’s to another ten years! Appearance at Nine Lessons and Carols with Robin Ince. This entry was posted in Annual Review, Articles. Bookmark the permalink.